Polaris in paperback! Summer books on Goodreads! 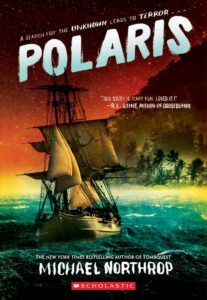 There’s something sinister lurking belowdeck on the proud sailing ship Polaris, and a young and untested crew must get to shore before it gets to them! You can sail away with a copy at Amazon, Barnes & Noble, your local independent bookstore, or wherever books are sold! And you can now add both of my summer middle-grades on Goodreads! Click here to add On Thin Ice, a small-town contemporary tale and a modern response to Victor Hugo’s The Hunchback of Notre Dame, on shelves everywhere July 30. Where It’s At: a quick update on All The Things! There are so few constants in life. Seasons change, the news swirls… But one thing you can count on: It has, once again, been way too long since my last blog post! With that in mind, here’s a quick update on where things stand. Some people call them galleys. Some people call them Advance Review Copies (ARCs). I call them exciting! They come out before the actual official books to give reviewers, booksellers, librarians, and other wonderfully bookish an early look. 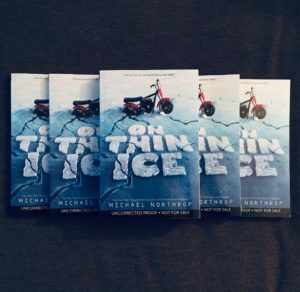 Here’s a look at the ARCs for my upcoming middle grade novel ON THIN ICE. As you can see, they are a veritable rhapsody in blue! I love this book so much. It will published by Scholastic on July 30, 2019. Until then, you can learn more or even preorder it (pretty please!) so that you’ll have it as soon as it comes out at Amazon, Barnes & Noble, or from your favorite local bookstore! 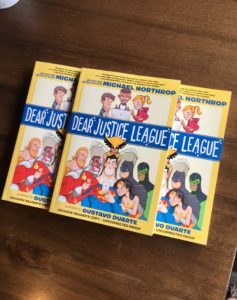 Meanwhile, at the Hall of Justice… The galleys of my first graphic novel, DEAR JUSTICE LEAGUE, just flew in from Metropolis! It is a fun, funny blast of a book that shows a whole different side of your favorite heroes, and Gustavo Duarte’s artwork is amazing! 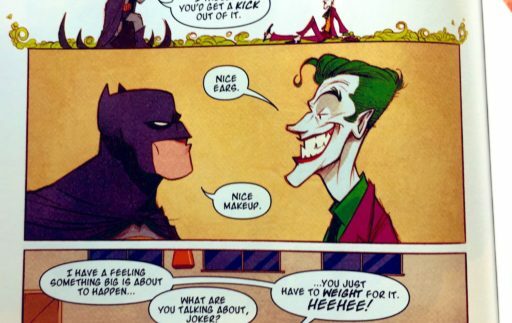 And OK, fine, here is one quick peek inside: Batman’s first encounter with his arch-enemy, The Joker! This one comes out from DC Zoom on August 6, exactly ONE WEEK after On Thin Ice—it’s gonna be a heck of a summer! You can preorder it at Amazon, B&N, and your favorite local indie. That would be Super, man! You can also get a free sneak peek at your favorite local comic shop on May 4. DC has printed up these amazing mini books, featuring two chapters (Superman and Hawkgirl! 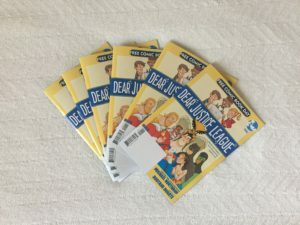 ), and is giving them away on Free Comic Book Day! Holy Loot Grab, Batman! Get thee to a comic shop! 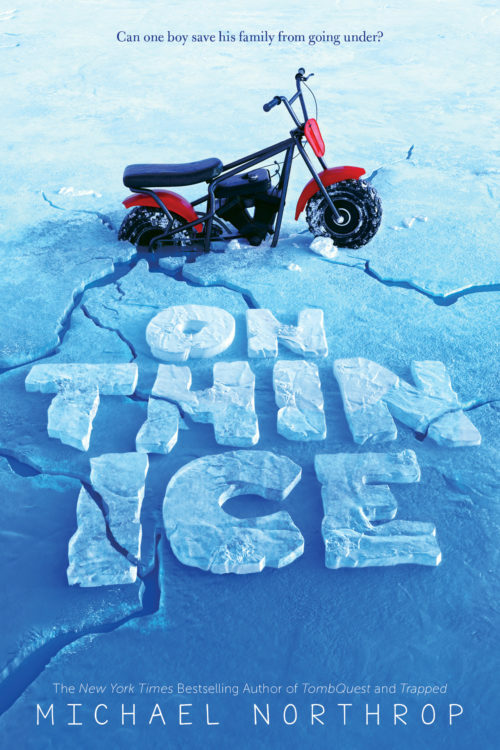 Cover Reveal: ON THIN ICE. After a long journey, my next middle grade novel rolls into view! You know how, when you get a big idea, you can be cautious and excited about it all at once? Well, I began whispering (cautiously! excitedly!) about this book idea to friends all the way back in 2012. I knew there was something there, but finding it… Hoo, boy! That took umpteen drafts, four major rewrites/overhauls, two editors, and three titles. I wrote eleven books and went through all of the ups and downs as eight of them (so far!) were published. You get the idea: It was a journey! And now, suddenly, here it is. Well, here’s the cover anyway. 🙂 I love it. This beautiful design captures the feel of the story perfectly and wraps it up in a few key plot elements and lots and lots of blue! Life for 12-year-old Ked Eakins isn’t easy. A rare spinal condition makes him a social outcast, the school bully is after him, and then his dad gambles away their rent money. Though it seems like everything’s against him and he should just give up, Ked decides it’s time to take his life back. He hatches a scheme to make enough money to save their home: He’s going to rebuild a vintage minibike and sell it at a profit. But the plan is a gamble of his own, and what seemed like a good idea quickly lands him in deeper trouble. Now Ked’s really on thin ice. Ked has his determination and creativity, and the school’s maker space provides him with a place to build. But can Ked and the other Makers save his family from going under before it’s too late? This contemporary response to Victor Hugo’s The Hunchback of Notre-Dame is a classic underdog tale and Michael Northrop at his gritty, gripping, unflinching best. It is a powerful portrait of a failing factory town and the families who are being dragged down with it. 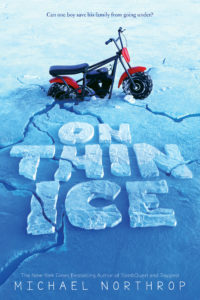 Ultimately, On Thin Ice is about daring to create when your whole world is crumbling. Exciting, right? It’s too early for bookstore or Amazon links or anything like that—but you can add it on Goodreads! Anyway, I am very excited about this one. (What has happened to all that caution?!) I can’t wait for the world to meet Ked and the gritty little town of Norton, Maine! 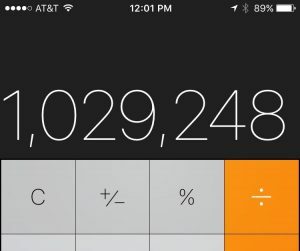 Milestone Alert: a million books sold! I remember sitting at a desk at Salisbury Central School as a kid and listening as our math teacher explained how much a million was—things like counting from 1 to a million would take 23 days. And I remember being completely overwhelmed, my face probably just one big NO WAY! Well, *several* years (OK, decades) later, I am overwhelmed again. I just received my latest royalty statement, and I did the math (I did occasionally pay attention in that class). It’s official, my books have now sold more than one million copies! Hooray! I understand the concept and the number a lot better these days, but this time I am overwhelmed by gratitude (and maybe a little disbelief). So many people helped me reach this milestone, from my indomitable agent, to my editors and all the other hardworking, book-loving people working at my publisher. And outside of industry circles, I really want to thank all of the booksellers and teachers and librarians and parents, and of course the good folks at Scholastic Book Fairs and Clubs, where many of these books were sold. Most of all, though, I am grateful to all the young readers who have read and reread my books and even recommended them to their friends. You are all, well, one in a million! Super news: I’m writing a graphic novel for DC Comics! HUGE news! 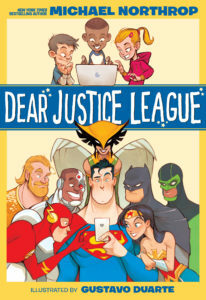 My first graphic novel, DEAR JUSTICE LEAGUE, will be published by DC Comics’ shiny new imprint for young readers, DC ZOOM! In the book, young fans write in to their favorite heroes, who respond with their own humorous and relatable stories of growing up, messing up, and stepping up. Holy guacamole: I get to write Superman! Wonder Woman! Green Lantern! The whole iconic crew! 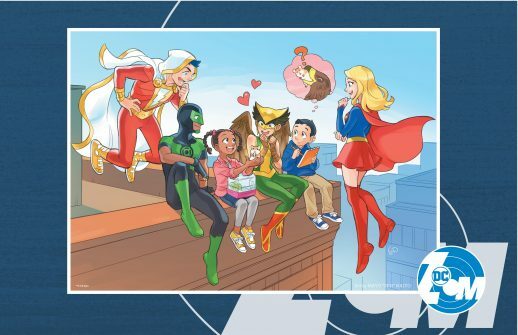 Promo art for DC Zoom! Here’s a link to the official announcement of the new imprints in The New York Times! (I’ve been in the paper of record five times now, I believe, and not once for anything criminal! Score!) My favorite part of the article is below—I’ve always wanted to be part of a Who’s Who! I’ve been working on this project for months already and it hasn’t been easy to maintain this secret identity. I am so glad that I can finally share the news with you! 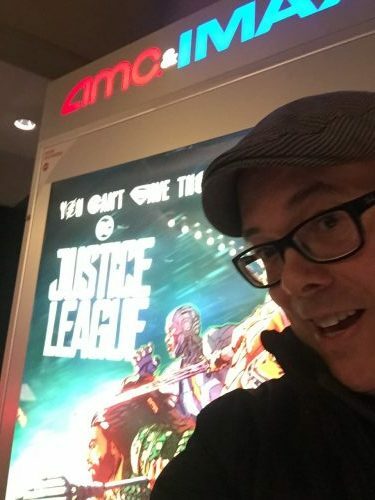 I grew up as a proud comic book nerd (making regular pilgrimages to a great comics store called My Mother Threw Mine Away in Torrington, CT), and I am still a proud comic book nerd. And now—somehow, unbelievably—I am a professional comic book nerd! The opportunity to write about these legendary characters is an honor and a thrill. And making them fun and accessible for a whole new generation of young readers is a challenge that I happily accept! Almost Famous: Check me out on KidLit TV! I had a fantastic time talking about books, sharks, baseball, and the monster at the top of the stairs(!!!) with the inimitable Rocco Staino on KidLit TV. Check it out if you have ten minutes to spare. The interview is sure to go down in history as a major scientific breakthrough, capturing heretofore unimagined levels of dorkiness on film, and it is worth watching for the cartoon fish alone! 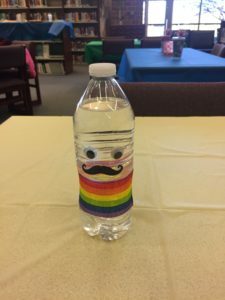 If you’d rather read an interview than listen to me yatter on, there is a good one up at School Library Connection, where I am the Author of the Month for January! I even talk about my old stand-up comedy days! POLARIS tour: a fantastic voyage to Illinois! A sign of the times: A warm welcome on my first morning! 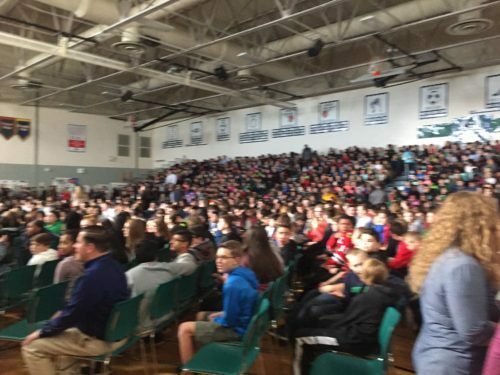 A sea of students: Presenting to more than a thousand kids at Heritage Grove Middle School! After that, I clearly needed some water! 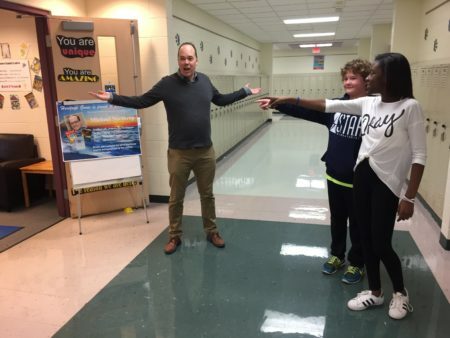 Navigation was an issue, but my student guides got me where I needed to go. 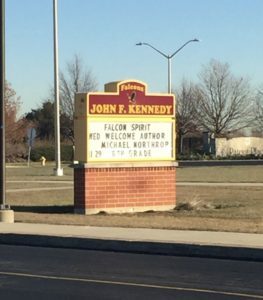 It was smooth sailing at Hadley Middle School, where I earned the rank of Captain Northrop! Thanks so much to Scholastic Books Fairs and all of the amazing librarians, teachers, and administrators who made this trip such a success. And of course, thanks to all the awesome students who made it such a joy! It’s here! The strange and scary sci-fi/horror/historical fiction mashup that began with a name that came to me in the dead of a sleepless night, POLARIS, hit shelves on Halloween! I’ve added it to my Books Page, and it’s fun to see all the nice things people have said about the book in one place. And the fantastic reviews are still rolling in! The latest is from the Bulletin of the Center for Children’s Books, which says POLARIS has “Everything a thriller reader could ask for.” I love that! My Books Page is here, and you can pick up this scary tale wherever books are sold. I am proud of this book and so excited to finally share it with the world! Two more amazing reviews! Plus, POLARIS is a Junior Library Guild selection! 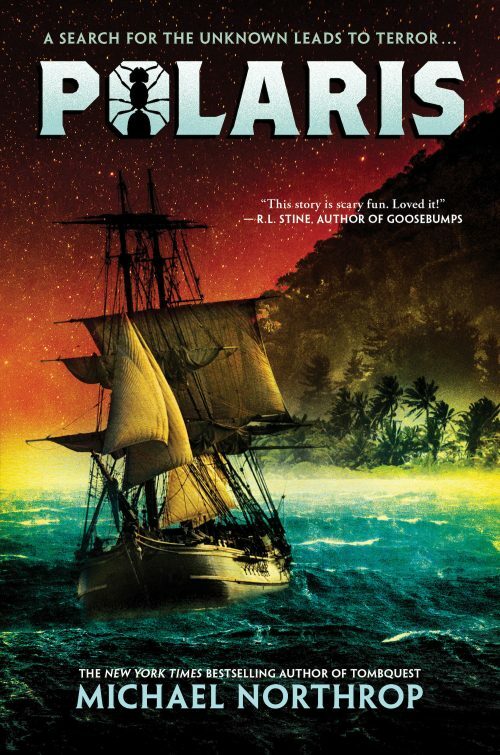 I already shared the first fantastic review for POLARIS a few posts ago. (That one was from notoriously tough Kirkus.) Now my scary sea story has received two more splashy reviews—and they’re great, too! One last bit of good news before I go. I just found out that POLARIS is an official Junior Library Guild selection. JLG is a fantastic organization that’s been around since 1929, and I am honored to be included. Anyway, that’s all the news for now. Fall is in the air here in New York City, and it won’t be long until this dark, scary tale is out in the world! I’ve never really gotten much promotional “swag” for my books before, but an author friend of mine recommended a place and, well, long story short, I just got a boatload of POLARIS bookmarks and some Trapped stickers, too. 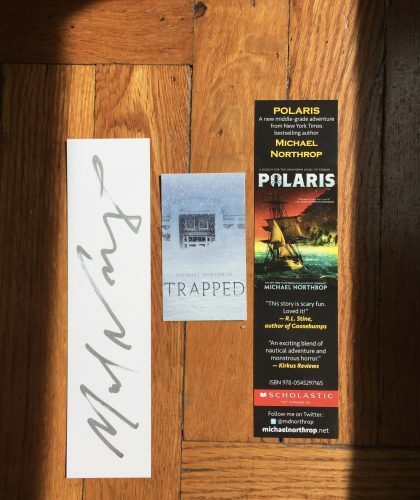 If you preorder POLARIS anytime before it comes out on Halloween ’17, just let me know, and I’ll send you a signed bookmark and a Trapped sticker or three. The order can be from anywhere: Amazon, B&N, your local indy (always my favorite), you name it!